_The Frontier20 product line is so simply perfect, elegant and functional, that the challenge of installation is not “How can I install Frontier20?” but rather, “Where else do I want to install Frontier20?”. 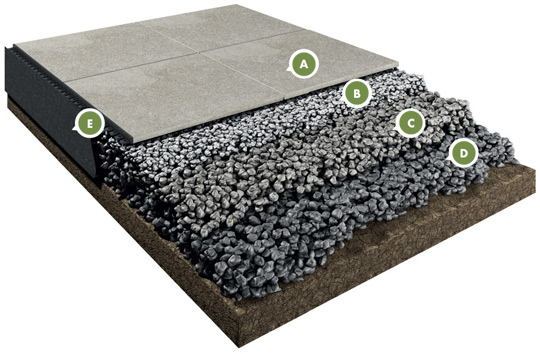 Frontier20 may be installed using the traditional mortared bed, the more modern over sand and limestone, to the eco friendly permeable method, or even the budget conscious elevated deck or pedestal application. 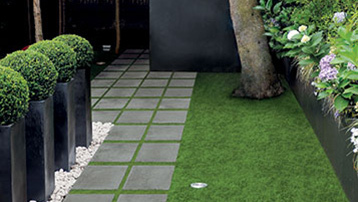 A way of laying pavers that allows you to support plates directly onto grass, gravel or sand. 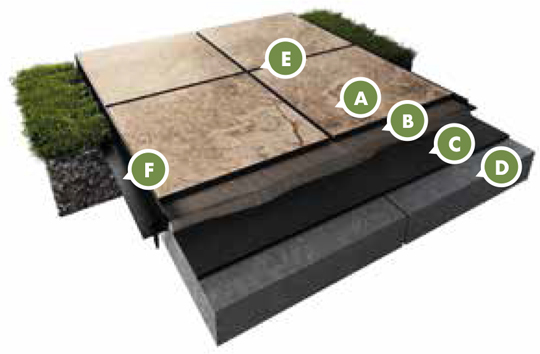 A way of laying pavers that allows you to create perfectly stable surfaces of incredible resistance. 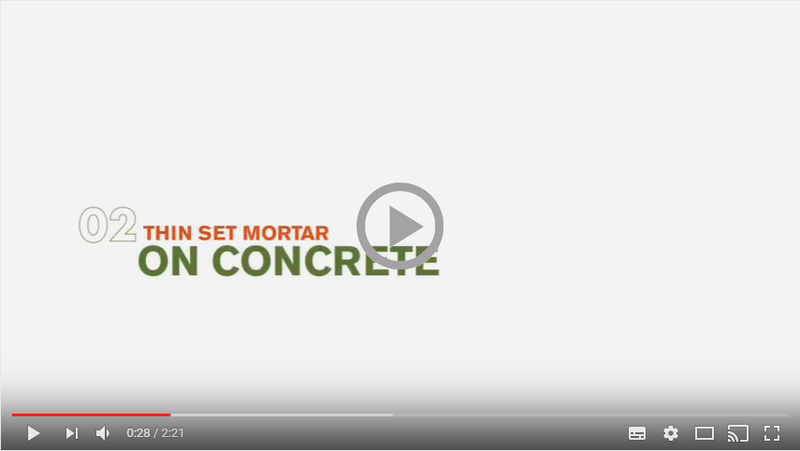 * When installed over reinforced concrete (4” minimum) using a thinset/thickset mortar suitable for porcelain paver. 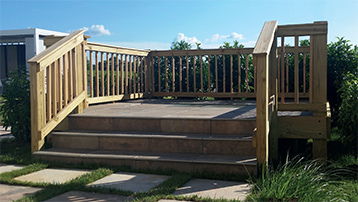 Traditional deck made with wood and porcelain pavers. 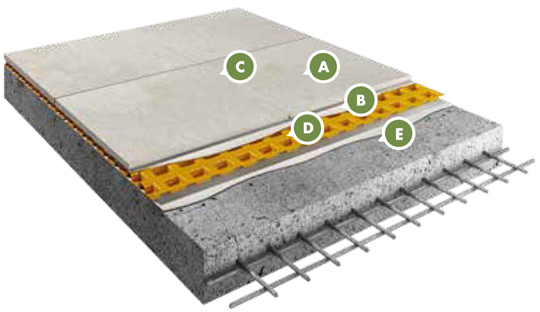 Slabs matched with a support structure for raised high-performing floors that also leaves sufficient room for under-floor inspection. _The surface in 20mm thickness can be laid onto the substrate without adhesives, lending itself to applications onto grass, gravel and sand. Sought-after ambiance in the home come to life quickly with incredible ease and simplicity. 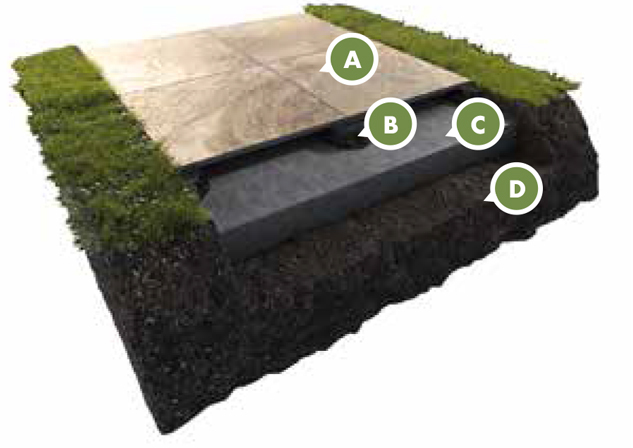 _The slabs are laid dry onto a grass surface without the need for adhesives. 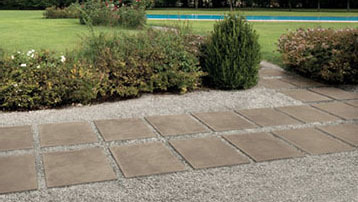 The external paving can easily be altered at any time and each slab can be removed and reused. _Frontier20 can be easily installed onto grass substrates simply by following the recommendations set out here: simply cut your grass in the desired application area as short as possible. Bare earth is always better. 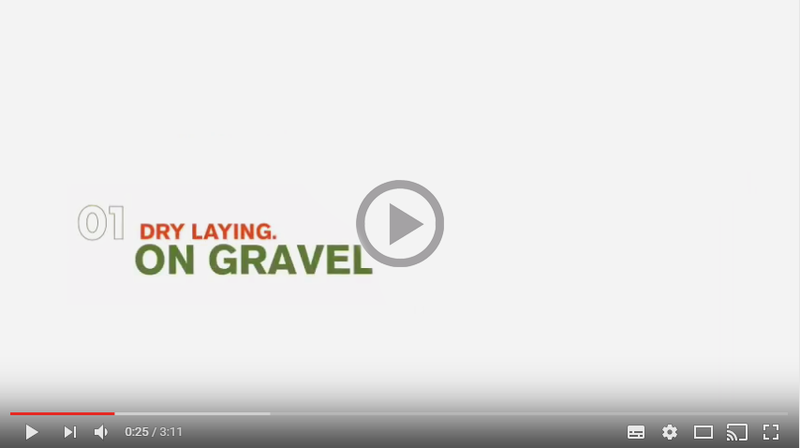 Rake out loose soil or a bed of fine gravel to level out the grade as needed. Compact loose soil or gravel and install. Take into consideration “rocking” of the paver. If “rocking” occurs adjust the soil or gravel and make it flat and level. The stratigraphic images are just an example of the type of application and technical features of Frontier20. Landmark Ceramics recommends to refer to the specific norms valid in the various countries to carry out a state-of-the-art installation. 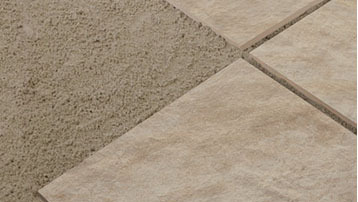 _Installing porcelain pavers over gravel can allow a cost effective means to allow for water drainage on a flat patio. Costly swales and drains are no longer necessary. 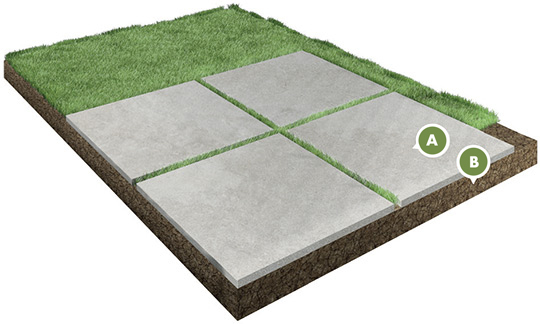 Simply put down a base of 4-6” of compacted limestone (57 limestone), screed the stone level, compact the stone and with the use of paver spacers leave a minimum 1/4” joint that will allow water to freely flow directly underneath your patio or walkway. The joint can then be filled using 1/2” stone chips or flakes. 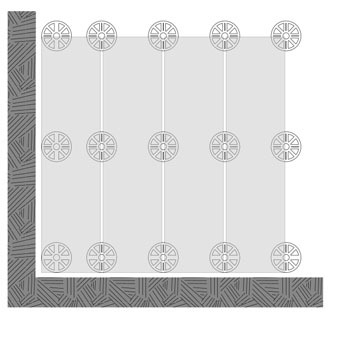 The application can also be utilized as an overlay for an array of existing substrates. 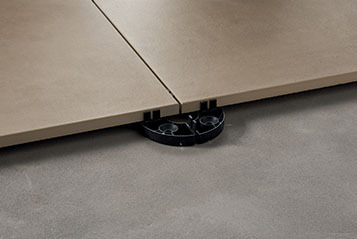 _Frontier20 can be installed onto gravel substrates simply by placing the slabs next to one another with a minimum 1/4” gap in between. Having coarser limestone below and successively finer layers of limestone below the paver allows for a permeable eco friendly free draining Installation. This installation solution is functional, quick and promotes a strong visual impact that is aesthetically pleasing. Insure the plastic 3/16” (4 mm) spacers are installed at all corners of the installed pavers, in order to prevent pavers from touching each other (and potentially chipping) and to allow better water drainage. The stratigraphic images are just an example of the type of application and technical features of Frontier20. Landmark Ceramics recommends to refer to the specific norms valid in the various countries to carry out a state-of-the-art installation. 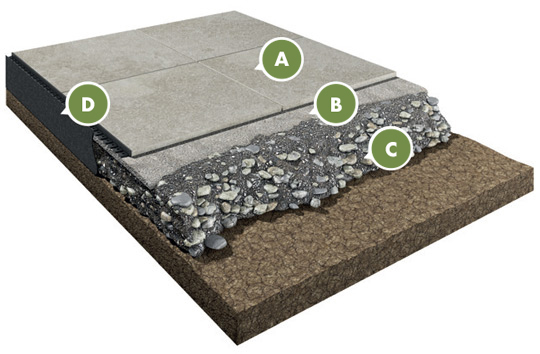 _Traditional concrete paver installation can also be utilized and is the ideal installation practice, especially where ground frost is common throughout the winter. 4-6” of compacted road base grade limestone should be used with a sand as a top dressing. 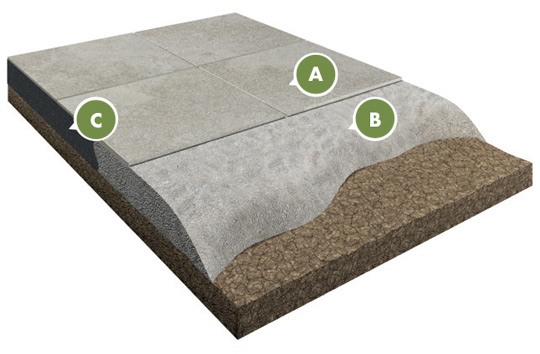 With concrete pavers typically 3/4” -1 1/2” of sand is common. 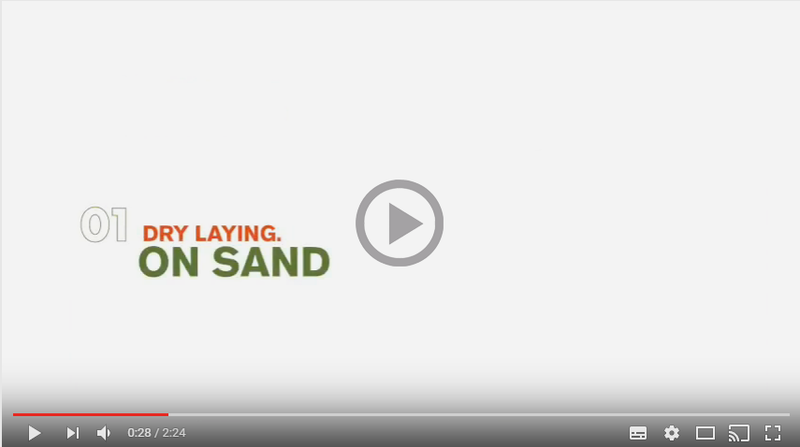 We recommend only 3/4” of uncompacted sand. This allows for the easiest installation and allows for reconfiguration at anytime. 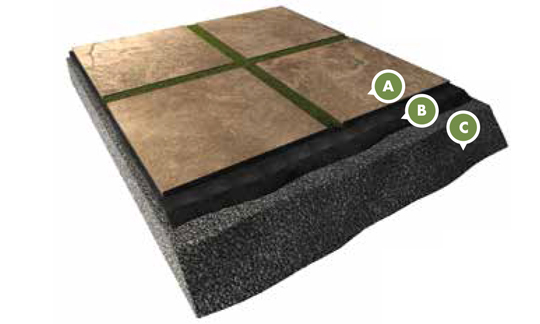 Again a minimum of 1/4” joint should be maintained and filled in with your choice of paver sand. _The Frontier20 may also be installed with tradional methods using thinset/thickset mortar appropriate for use with porcelain paver. In a short 24 hours your floor will be ready for foot traffic. 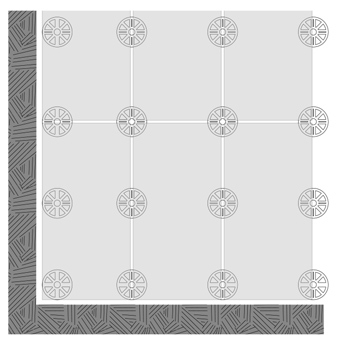 This method offers the most stable and most durable floor covering that is able to withstand foot traffic up to light vehicular traffic. * It is recommended installation over 4” minimum thick reinforced concrete, using a thinset/thickset mortar suitable for porcelain paver. 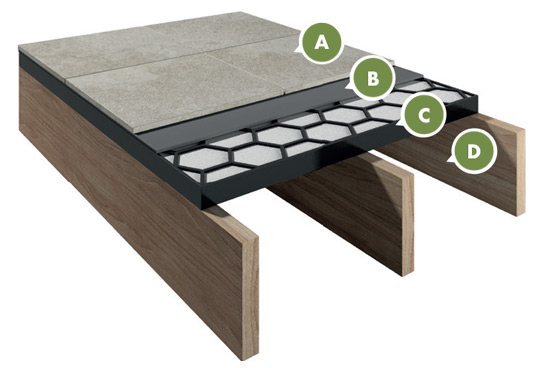 _Landmark Ceramic’s Frontier20 combined with a grate system allows porcelain paving to be utilized in conjunction with an existing or new construction wood deck structure. As long as the wooden deck structure is constructed soundly and according to local codes, the honeycomb plastic grate is installed as the substrate for the porcelain paver. 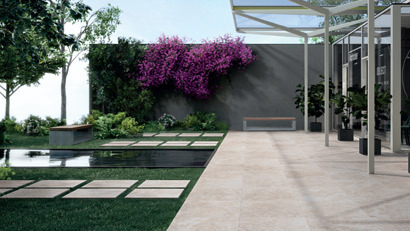 This system is highly innovative and functional for the design of contemporary outdoor spaces. 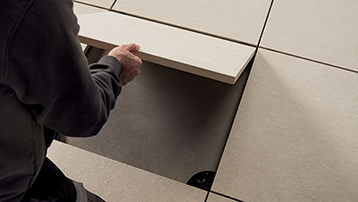 _In combination with a suitable structure the Frontier20 porcelain paver in 20mm thickness lend themselves perfectly to floors with a suspended installation. 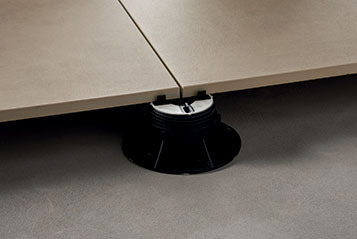 The adjustable stand means being able to create an air space under the floor in which to lay electrical conduit or plumbing. 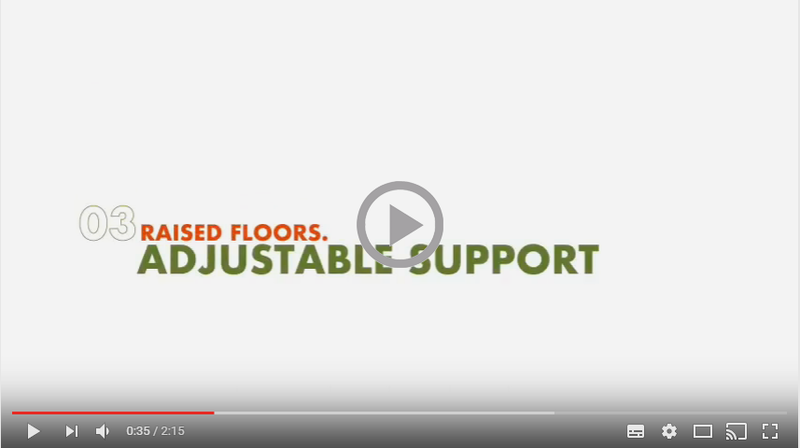 The raised flooring system is easy to manage, allows you to configure the underlying wiring or plumbing systems based on specific needs and also to change its configuration any time a new look is needed. 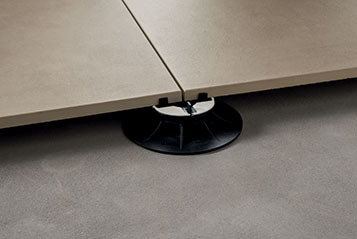 _For raised installation, Frontier20 slabs are installed onto pedestal supports with a distance of a 1/4” between adjacent slabs once the underlying footing has been duly layered with water-proofing materials. In this way, there is a technical gap below the foot-plan that can be easily inspected by lifting the slabs. System made up of disks of variable thickness. Utilize for low height installation (up to 3/4”). System made up of adjustable height pedestal (from 1 1/4” to 16”). 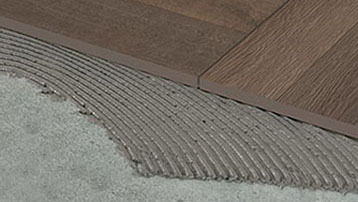 It is recommended to carry out raised installation onto a solid, resistant substrate with the correct inclination to guarantee water drainage. 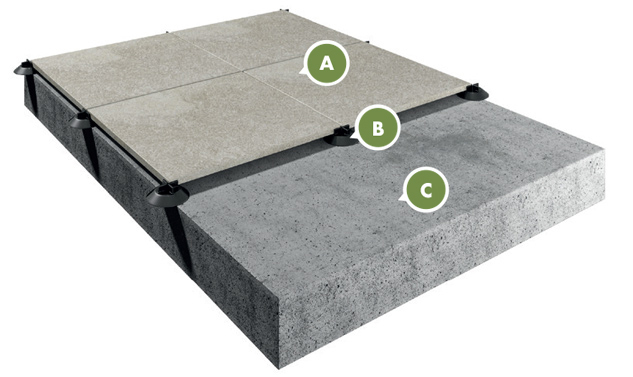 Support come equipped with four spacers that allow for the creation of grout lines between pavers. For a correct installation against walls or corners, it is necessary to keep the supports distant from the wall and remove 2 or 4 spacers as showed in the picture. Landmark Ceramics recommends to strictly follow the instructions for the raised installation of Frontier20. Want to learn more? Download Frontier20 catalog.